It's coming! Two weeks from today we'll be "celebrating" the made-up Hallmark holiday of Valentine's Day. I have nothing against Valentine's Day. I mean, it's a good thing, to remind people to say "I love you," but I feel so sad for anyone who has to wait all year to hear that they're loved. Every day is a good day to tell someone you love them. However, I love a good excuse to make cute crafts and cute food, so bring it on! 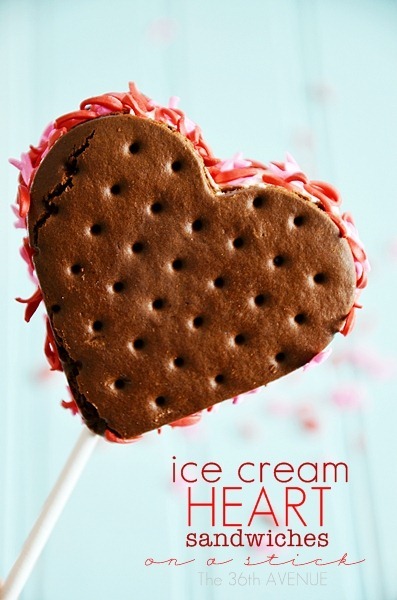 Here, for your crafting pleasure, are 13 fun heart themed crafts. But don't wait 'til Valentine's Day. 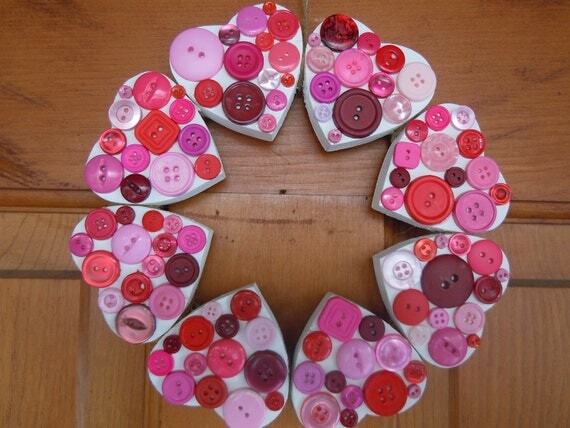 Every day is a good day to make a heart craft, too. For instructions, just click on the word "source" under the pictures. This is one of my favorite messy crafts! It just turned out so shiny and beautiful--the picture does not do it justice--and each one is unique. 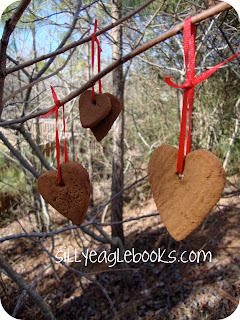 Love these simple heart ornaments made from cinnamon and apple sauce! Aren't these window clings sweet? I love that this heart tote bag is easy enough for a preschooler to make but sophisticated enough for a mama to carry. Look at these gorgeous heart-painted rocks! Now normally I would look at that and say, "no way would mine turn out that beautifully." But look--it's not hard. All it is is hearts and polka dots. You can totally do that! Here's another easy enough-for-a-preschooler-to-make project that is still lovely enough to make a part of your year-round décor. Love it. Here's a craft to help develop fine motor skills (in other words, if you want to keep your little ones busy for long periods of time, try this). 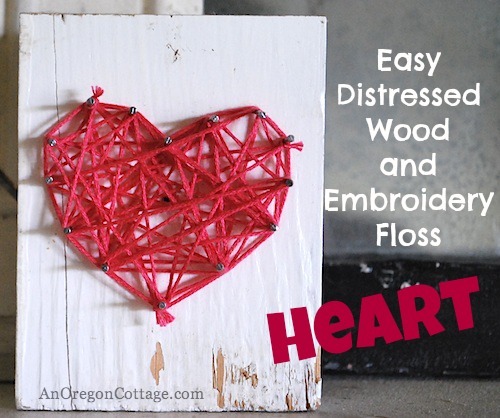 Just wrap yarn, string, or embroidery floss around and around and around a cardboard or tagboard heart. Glued to cardstock, these would make great school Valentine's cards. 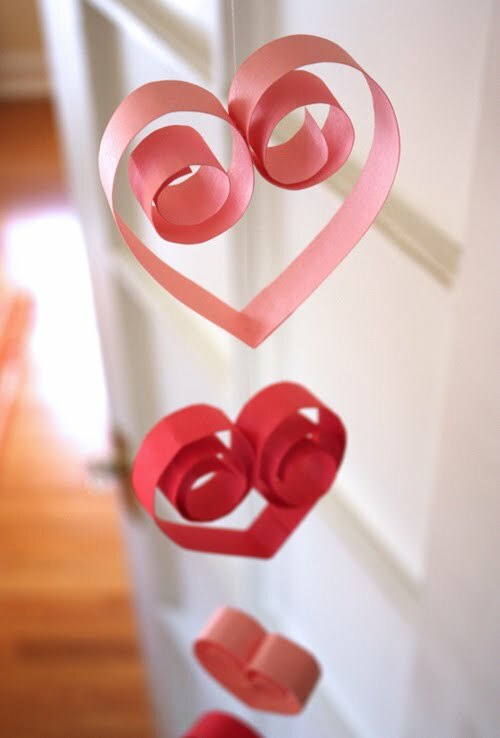 What an adorable heart garland. Whip one up in minutes and hang several in a doorway. 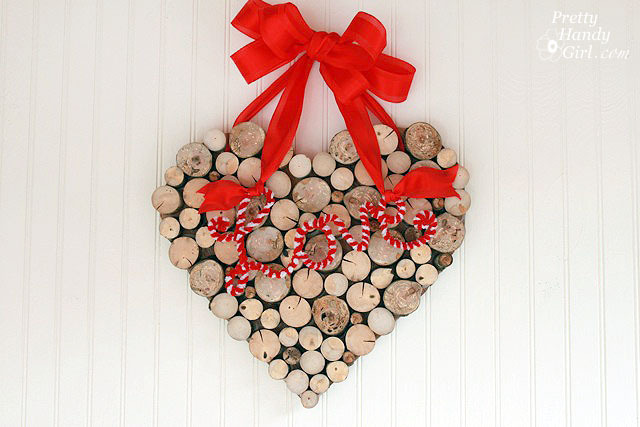 What a fun way to greet guests, with this wooden heart wreath. Just paint and decorate wooden heart cut-outs from the craft store, then glue them to a cardboard wreath-form cut from a cereal box. Anyway, you don't care about that (well, maybe you do. If you care about that, let me know in the comments). You came for the recipe. And what a recipe it is. Imagine a sweet, light, slightly cinnamon-flavored cake, swirled with cinnamon and brown sugar, and topped with a delicious vanilla glaze. Oh, and did I mention you can bake and eat one now and freeze one to bake later? Run, do not walk, to the kitchen to whip up this delectable treat. Right now. Well, you can read the recipe first. Preheat oven to 350 degrees F. Grease two 8x8" baking pans or one 9x13" pan. Stir together cake ingredients except melted butter. When ingredients are combined, stir in melted butter. Pour batter into prepared baking pans, sprinkle 1 1/2 t of brown sugar over each, and set aside. In a medium bowl, mix together topping ingredients until well combined. Drop tablespoons of topping evenly over cake batter and use a knife to swirl through the cake, making a marble design. At this point, you can bake both cakes and eat one, freezing the other to be reheated later, or bake one cake to eat now, and cover and freeze the other cake to be baked later. Bake 25-30 minutes or until a toothpick comes out nearly clean from center. Combine glaze ingredients, adding enough milk to make it pourable. Drizzle glaze over warm cake. Serve warm or at room temperature. To bake the frozen, unbaked cake, thaw in refrigerator overnight, then bake and glaze according to the recipe. Now go! Bake like the wind! Do you ever wonder how other people do things? Yeah, me too. Whether we're looking for ways to improve the way we do our own things, or we're just curious, inquiring minds want to know. Lora Lynn over at Vitafamilia shared on her blog how her family of 9 does laundry, and invited her readers to do the same. Maybe you don't care, but I felt inspired to share with y'all how I do laundry. If you're curious, or looking for ideas that may save you some time, read on. If not, feel free to click the x on this blog post. And please share how you do laundry in the comments (or if you blog about it, leave the link in the comments). Still here? OK, here's how we do laundry. First of all, let me define "we". We consists of 3 boys, aged 13, 10, and 6, a husband/daddy and me. The oldest does his own laundry whenever he feels he needs to. Which often means he's wearing the same underwear for 3 days in a row. Not OK, but I'm not buying more, 'cause then he'll just have longer before he does the 3 days in a row thing. The oldest kid, this is, not the oldest person in the household. Sheesh. For the rest of the family, laundry day is Monday. I sometimes start with a few loads on Sunday, and often it carries over to Tuesday, but I learned long ago that I am much more likely to get everything washed, dried, and put away if it's just once a week instead of every.darn.day. Everybody has 2 nested laundry baskets in their closet into which they deposit their dirty clothes. And, for the most part, that's where the dirty clothes end up. Yay for training them early! Hubby and I actually have 2 sets of nested baskets in our closet--one for dark clothes and one for clothes-that-will-be-bleached. No one else really has room for 2 sets of baskets in their closets, so I sort out anything white as I'm adding clothes to the washer. On Monday morning, the boys carry their full baskets to the laundry room, leaving an empty basket in their closet to catch the dirty clothes just in case it takes several days to get the basket back. So glad I figured that one out. We used to have huge piles growing on closet floors while the baskets were otherwise occupied. And then no one would seem to realize that they needed to pick up that big old pile of dirty clothes and put it in the basket when the basket became available, so the piles would keep growing while baskets sat empty. I wash everyone's laundry separately (except whites) so that when it comes out of the dryer, I know to whom it belongs. No sorting! The whites I do all together, but everyone has a different style of underwear and socks so it's easy to tell them apart. I usually have 1-2 loads of towels and sheets to do as well. Usually we end up with 6-7 loads altogether, although my record is 13 loads in one day. I just keep cycling the loads through all day long. As the laundry comes out of the dryer, it's placed back into the laundry baskets (which I sometimes remember to spray down with Lysol while they're empty) to await folding. But the thing about folding is, I need to be watching TV in order to do it. And there's nothing good on TV. So sometimes the baskets sit for a while...um...a week? At least it's clean, right? I fold the pants and put them neatly into stacks, stack the underwear, fold the socks, put the shirts on hangers, and put everything neatly back into the baskets. Then I tell the boys to take their baskets to their rooms and put their clothes away, which they do, although not so neatly. Each of the boys has a dresser in his closet for pants, socks and undies, and a bar for hanging clothes. It sometimes takes a week or so for everything to be put away (actually AKD usually doesn't put anything away--just uses clothes from the basket), but at least I've done my part. As long as each member of the family has something clean to wear, regardless of the magnitude of its wrinkliness, I've done my job. Right? Right. Oh, and a note on orphaned socks. Seems like there are unmatched socks left over after every laundry day. I used to send the sock back to its assigned dresser, figuring maybe its mate would show up there. What actually happened was these unmatched socks were never heard from again, and in the meantime, each new load would turn up new orphaned socks until there were no pairs left. Now I have a small basket in the laundry room to hold these socks. At the end of the folding process, I go through the basket to see if there are any matches, and usually there are a few pairs that get reunited. It's kind of like a dating service for socks. So that's how we do laundry. Hop on over to Vitafamilia to find out how Lora's family does laundry. Hey y'all. 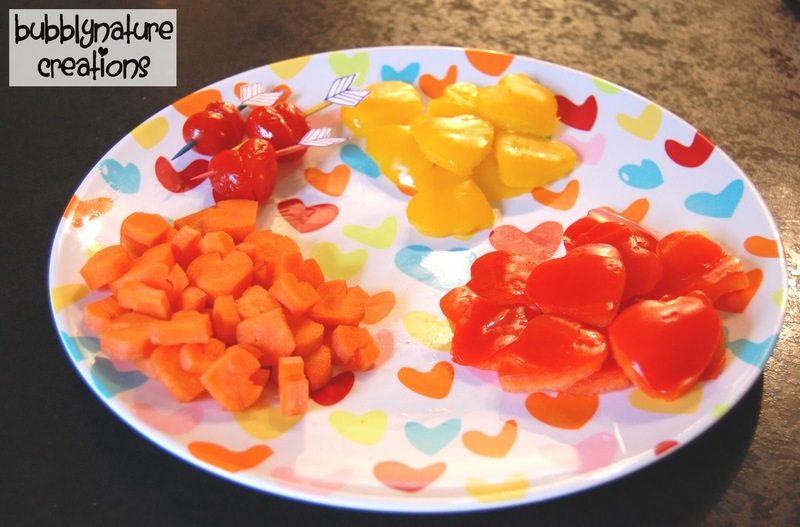 Why not put a little effort into making this Valentine's Day special for your family by preparing fun heart-shaped foods all day long? 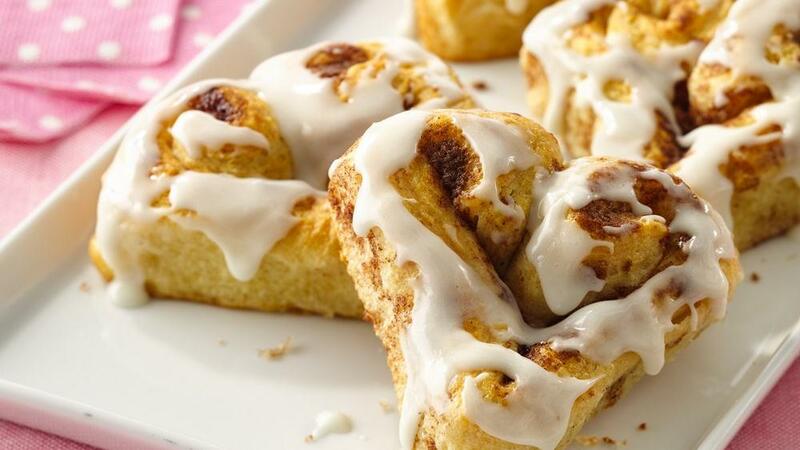 Or if you're in the mood for a little more sugar to start your day, how about heart-shaped cinnamon rolls (from homemade or ﻿﻿cinnamon-rolls-in-a-tube). 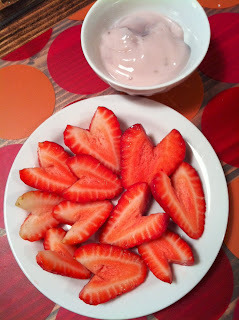 Whichever you choose, add some heart-shaped strawberry slices to add vitamin C and fiber. 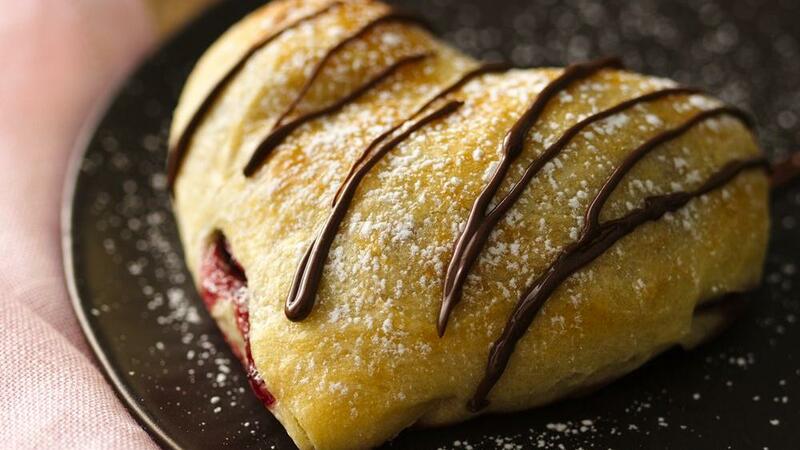 For lunch, try these heart-shaped calzone with marinara for dipping (use Pillsbury biscuits or crescent rolls if you don't have time to make a yeast dough), this cute heart-shaped hot dog, heart-shaped hard-boiled eggs, or a heart-shaped sandwich--this one is peanut butter and jelly with sprinkles. 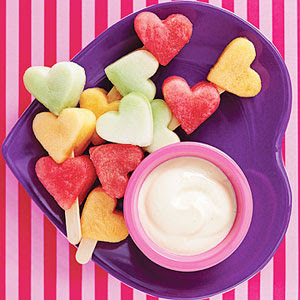 On the side, try melon heart kabobs, an apple with heart cut-out, and some heart-shaped veggies. For supper make this darling heart-shaped pizza with heart-shaped pepperoni or whip up some heart-shaped ravioli. 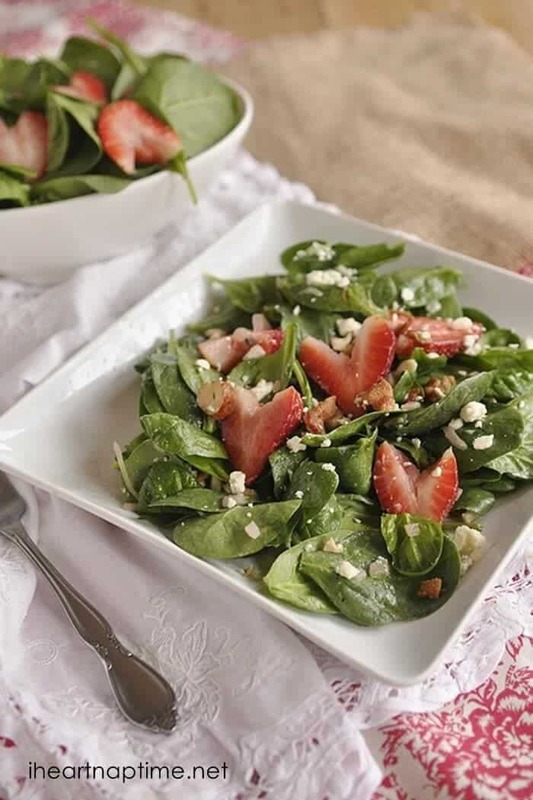 On the side, serve heart-shaped roasted or steamed veggies or a tossed salad with heart-shaped croutons and veggies or a warm spinach salad with heart-shaped strawberries. What will you choose, my friends? 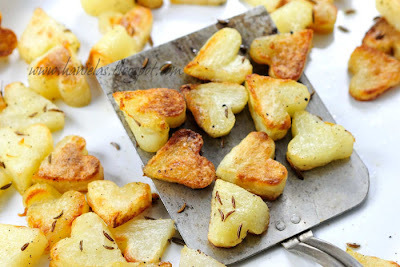 I don't know--I might just have to make heart-shaped foods for a week! While we were visiting Chip in December, she served my kids some Friendship Bread. And of course, that made them want more. That stuff is like crack. Only yummier. So I made myself some starter (contrary to popular belief, one does not need to be Amish to make Friendship Bread starter) with the intention of feeding it, growing it, then using it all on Day 10 (if you don't know what Day 10 means, click here for a basic explanation of what goes on in the Friendship Bread process) instead of passing some on to friends. And now, I need to ask you a question. It's a serious question that requires a serious, well thought-out response. 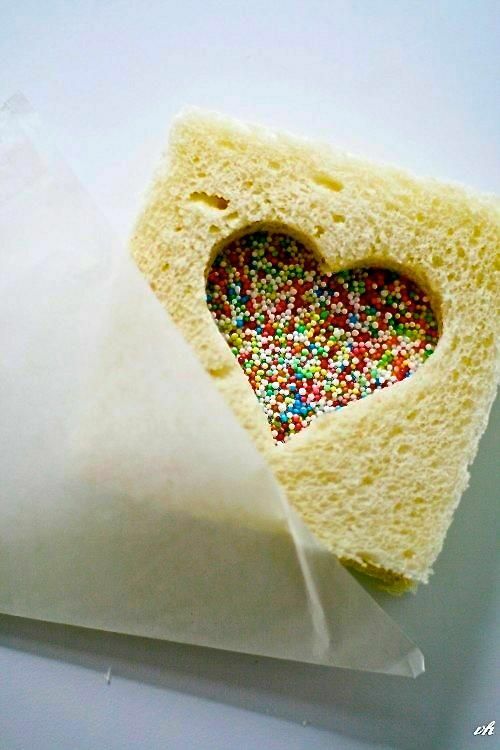 Friendship Bread. It is so good. But don't you ever get tired of the same old recipe time after time? I do, so I decided this time I was going to do something different. You probably already know that you can substitute any flavor of pudding in for the vanilla (again, if you don't know what I'm talking about, here's the basic bread recipe, except I use 2 cups of starter), so that's what I did. by adding chocolate pudding, along with about 1 cup of semi-sweet chocolate chips. I also omitted the cinnamon. So delicious. by omitting the cinnamon, and substituting lemon pudding, adding 2 T poppy seeds (I would add 3 T next time). Only I didn't realize that I was out of poppy seeds, so I added chia seed instead. Yes, lemon-chia tastes just like lemon-poppy, but you get all those great chia benefits. Everyone loved it. I also made one loaf of traditional Friendship Bread, using the original recipe. Nothing to call home about, really. It's just regular Friendship Bread with a few substitutions. However, my friends, I was AMAZED at all of the other variations I found. I used my last cup of starter to make Cinnamon rolls from this recipe. I also found recipes for things like pizza dough, dinner rolls, whole wheat bread, pie crust, peach cobbler, brownies, pancakes, and waffles. There are over 200 different Friendship Bread variations in The Friendship Bread Kitchen's recipe box, including gluten free, vegan, paleo, and sugar-free options. Amish Bread Friendship has another 100+. And that's not all. Do an internet search for "Friendship Bread Variations," you'll see. I think I'm gonna have to pull 'em out of a hat! Happy Friendship Bread (or Shirley) making! When I say, "pig in a blanket," what do you think of? My husband is of Dutch ancestry, and he insists that those things up there are something else. I don't know what he would call those--maybe something creative yet descriptive like hot dogs in crescent roll dough. But whatever, he would say those are definitely not pigs in a blanket. Real (according to Dutch descended Americans) Pigs in a Blanket are a mixture of ground beef and pork sausage shaped into logs and covered in flaky pastry. They taste a lot better than hot dogs in crescent roll dough, and they're actually really easy to make--not quite as easy as wrapping a hot dog in crescent roll dough, but easy enough. These also freeze well, so feel free to make a large batch, bake some now, and freeze some for future meals. Mix together and form into logs. I used a 1/2 c. measure and got about 20 pigs. Grandma R's were smaller--she got 44. Stir together flour, baking powder and salt. Cut in shortening until crumbly. Add eggs and milk and stir to form a sticky dough. Roll out dough in a strip, about 1/8" thick, the same width as your pigs. Use a lot of flour to keep the dough from sticking. And I mean a lot. My eyes were so wide as I watched Grandma flinging more and more flour onto that table. I could not believe the amount of flour she used, until a couple of years later when I made these by myself and discovered it was necessary. Do not be afraid. Place one pig at the edge of the dough and roll until covered. Cut the dough, brush off excess flour, place blanket-ified pig on a baking sheet and repeat with remaining crust and pigs. To eat now: bake in preheated 350 degree oven until done (165 on a meat thermometer), about half an hour. 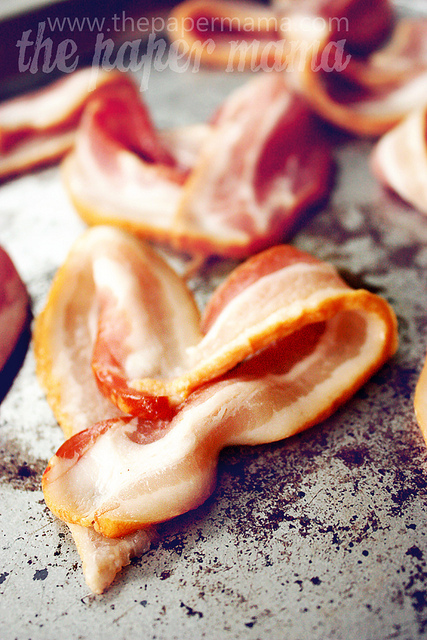 To freeze for later: place pigs in single layer on large baking sheet and flash freeze until firm, about an hour. Place pigs in an air tight storage container (freezer storage bag, Styrofoam tray covered with plastic wrap and foil, etc) and freeze until ready to use. To serve: thaw and bake according to instructions OR bake from frozen, adding 15-30 minutes extra to baking time (rely on meat thermometer to tell you when they're done). I don't make these very often, because they're terribly unhealthy* (better for you than hot dogs in crescent rolls, though), but when I do, I love to meditate on the wonderful woman who loved and nurtured her family, including my mother in law and husband, through the years. Making and eating these is like getting a hug from Grandma. I hope she approves. *I make these as written because they remind me of Hubby's grandma, and as I said, we don't have them very often, but if you want to make them a bit healthier, use turkey sausage in place of pork and use extra lean beef. Substitute whole wheat flour and palm shortening in the crust. Use egg substitute and skim milk.